Immune system. 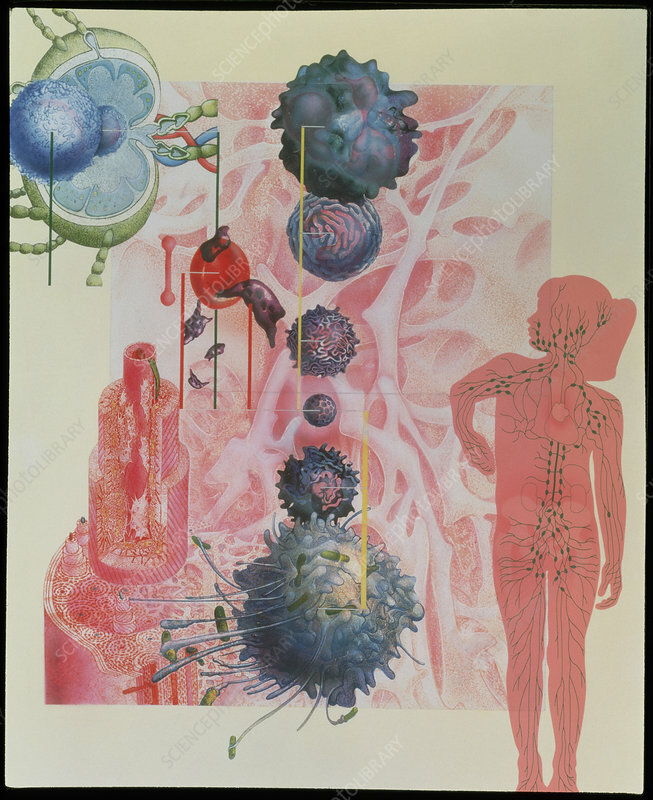 Collage artwork of cells of the immune system. Many different cells develop from a common stem cell in the bone marrow. Lower left shows the structure of bone and the background shows its calcified matrix. At lower centre is a stem cell (small). Above it are an eosinophil, a basophil and a neutrophil. Underneath is a monocyte, a precursor for the phagocytic macrophage (below). At upper left are red blood cells and platelets (irregular). At top left is a lymph node and lymphocyte (blue, round). The lymph nodes form part of the immune and lymphatic system as shown on the figure at right.